A new year, a clean slate. As I welcomed in the new year, I spent time reflecting on the last year, on where I've been and where I'd like to go. In these moments, I have a tendency to focus on my weaknesses, to identify ways I feel I've come up short to my good intentions. Despite my efforts, my lifestyle leans towards the sedentary, the house is in a constant state of needing to be picked up, and my ever-present sweet tooth continues its habit of getting me into trouble. This year, instead of fixating on the negative, I intend to look towards the positive, to recognize all the ways I have grown (and can continue to grow). I have no list of resolutions for the new year. Instead, I am working on cultivating a series of intentions—to find the good in stressful situations, to maintain positivity when working with other people, and to push myself to become more skilled at things that I love (like teaching, baking, and woodworking). Luckily, practice makes perfect. I anticipate my oven will get plenty of work as I develop and play around with new recipes. 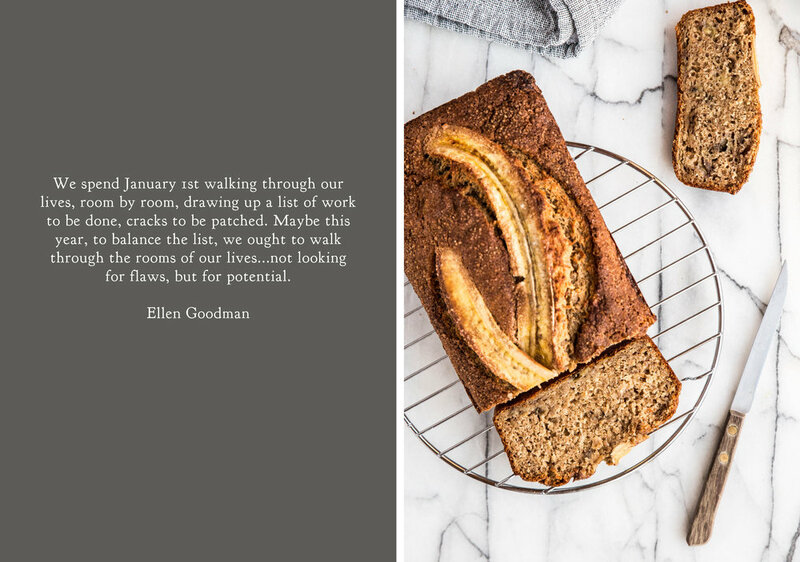 In the past, I have been guilty of loading my banana breads with so many extras that the banana flavor can be lost or overpowered. Certainly these versions have their moments—this loaf with a chocolate hazelnut swirl makes for a lovely dessert and this chocolate cacao nib loaf is best for a morning snack—but sometimes it is worth it to tend towards the traditional. 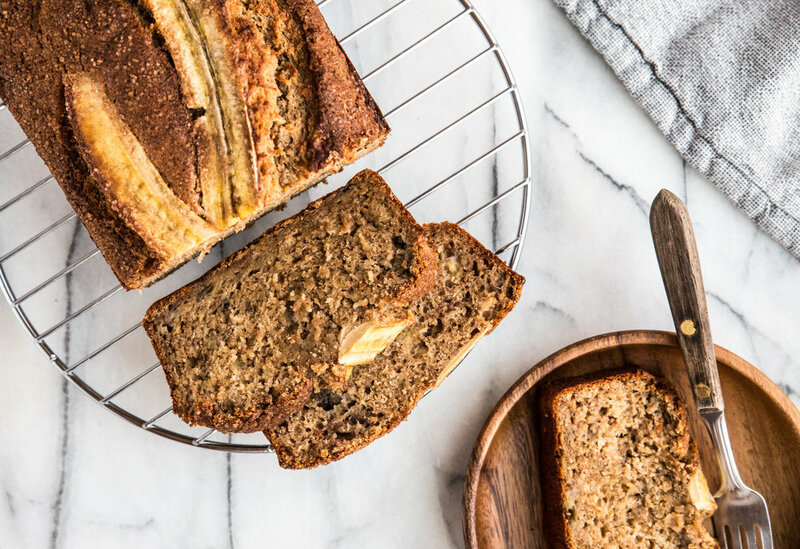 This recipe for Maple Banana Bread is a lighter version of the classic loaf, allowing the flavor and natural sweetness of the banana to shine. With the addition of maple syrup, the sweetness hits a subtle, but pure note. 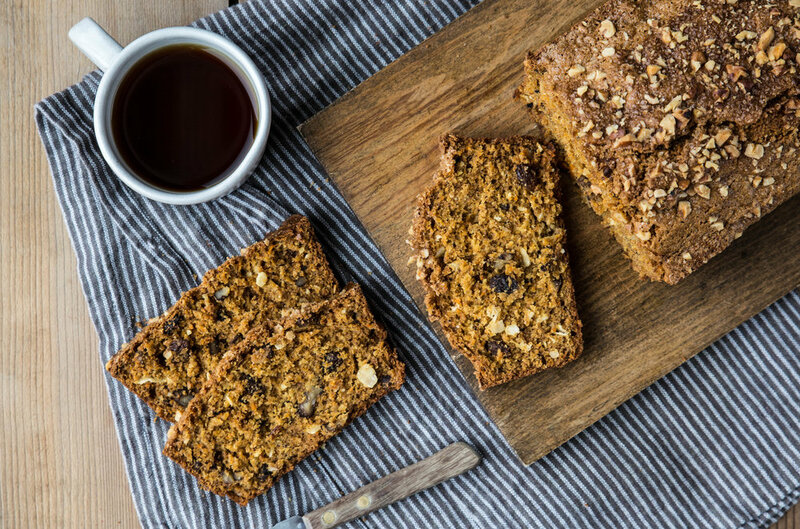 Whole wheat flour is added to bring in whole grains and the loaf is spiced with cinnamon and nutmeg to round out the flavor. As with all of my quick breads, I like to sprinkle a little raw sugar over the top for extra sweetness, giving the loaf something unique. 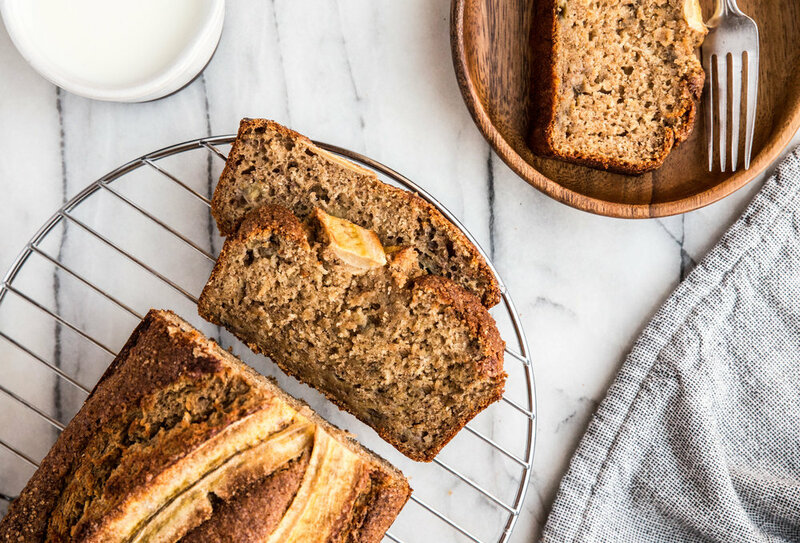 Maple Banana Bread is a lighter take on the traditional loaf of banana bread. Sweetened with maple syrup and gently spiced, this recipe allows the flavor of the banana to shine. 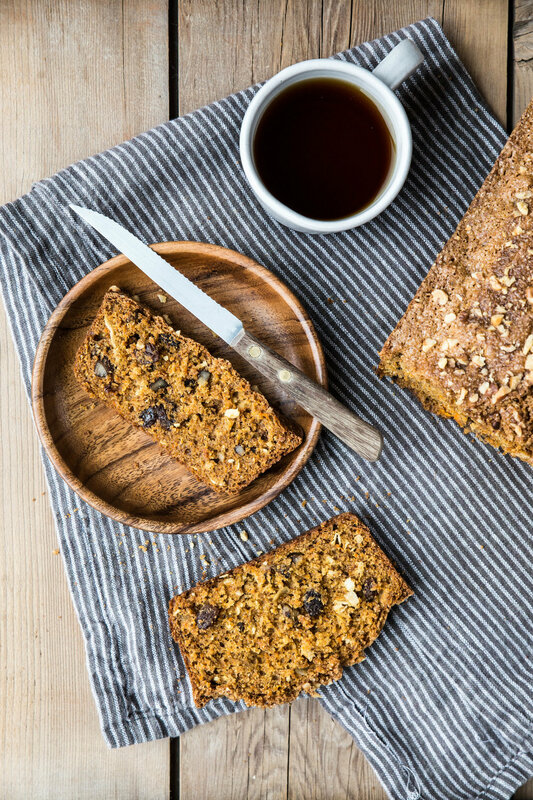 A topping of cinnamon and raw sugar give the loaf additional sweetness and texture. 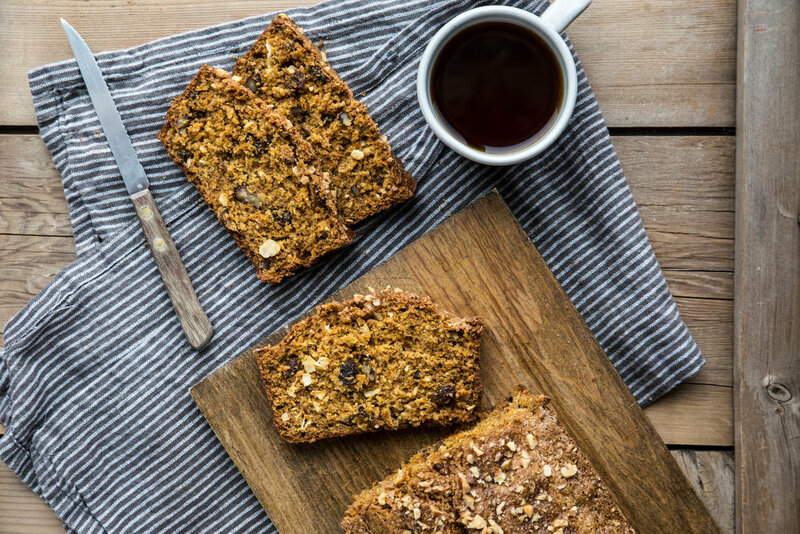 Serve alongside a mug of coffee or tea with breakfast or an afternoon snack. Preheat oven to 350 degrees F (180 degrees C). Grease a 5 x 9-inch loaf pan. Set aside. In a large mixing bowl, whisk together mashed banana, maple syrup, vegetable oil, eggs, and vanilla extract until uniform. Whisk in the cinnamon, nutmeg, baking powder, baking soda, and salt. Gradually stir in the flours. Set aside. For the topping, stir together the raw sugar and ground cinnamon. Set aside. Pour batter into prepared pan and smooth until level. Sprinkle topping evenly over the top. If desired, place two pieces of thinly sliced banana on top for garnish. Bake for 55-65 minutes, or until a toothpick inserted in the center comes out clean. Cool in pan for 10 minutes before removing and placing on a cooling rack to cool completely. My family's holiday traditions have evolved throughout the years. While some traditions stay true, others have gone through revisions. Locations have changed and the guest list adapts as we welcome new faces and say goodbye to those we have loved the longest. While some changes may be bittersweet, we know the importance of gathering together to share and show our love, whether catching up over good food and conversation or stopping on each other's doorsteps for a brief hello. For the last few years, my family has spent Christmas close to home. On Christmas Eve, we open presents near the fireplace, as A Christmas Story plays quietly in the background. In the spirit of new holiday traditions, I wake up early on Christmas Day to bake something warm from the oven to create a new set of sweet memories. Since I fly home across state lines near Christmas Eve, I look for recipes to bake that are simple and easy to accomplish—there is no time to spend hours in the kitchen. This year I have partnered with Dole Sunshine to #SharetheSunshine by bringing you a holiday recipe that meets these criteria. 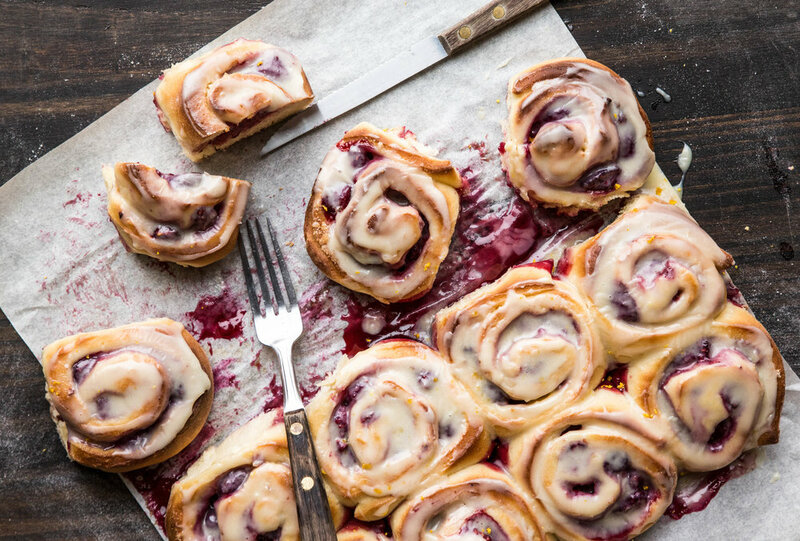 These Raspberry Swirl Rolls give a fruity twist to the classic cinnamon roll. While a yeast dough may not appear simple at first glance, it is during a closer look. Since the dough spends the majority of time rising and baking without needing attention, there is only a half hour of active time in the preparation. Even better, the recipe can be prepped the evening before and tossed into the oven the next morning for a warm breakfast without creating a messy kitchen. In the winter, frozen fruit can provide a superior quality in both flavor and consistency when compared to fresh fruits that are out of season or shipped in from another country. Frozen raspberries are the key to making these rolls with less mess and a more vibrant flavor. The frozen raspberries keep their shape when mixed into the filling and when rolled into the dough and sliced, which keeps the counter tops clean. In the oven, the raspberries transform into a bubbly, gooey filling, which is brightened by the addition of orange zest. A white chocolate spread on the rolls hot from the oven makes these worthy of a second helping. To begin your weekend or holiday morning with warm rolls, the rolls can be assembled the night before and baked the next morning. The evening before, prepare the dough and place the sliced dough in the 9 x 13-inch pan. Wrap the pan tightly in plastic wrap and place in the refrigerator overnight. In the morning, preheat the oven and set out the dough to warm and rise until doubled, about 30-45 minutes, and bake the rolls as indicated. Alternatively, the rolls can be baked the evening before, covered with aluminum foil, and reheated in a 350 degree F oven until heated through. May your holiday mornings be filled with flavor, family, & cheer. Happy Holidays, dear friends. 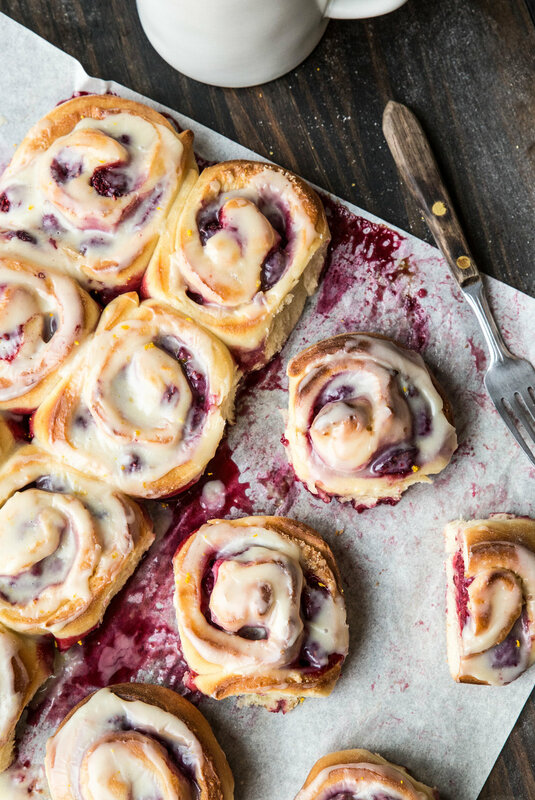 Raspberry Swirl Rolls with White Chocolate Glaze make for a dreamy addition to your holiday brunch menu. The tartness of the raspberries is complemented by the sweetness of the white chocolate glaze and the hint of orange zest in the filling. The rolls have a soft, but chewy texture enhanced by the gooey fruit filling. Serve warm from the oven and share with dear family and friends. For the dough, place lukewarm milk, melted butter, yeast, egg, sugar, and salt into a large mixing bowl. Whisk until combined. Add flour and stir until the mixture begins to form a dough. On a lightly floured surface, place the dough and knead by hand until smooth and elastic, about 5-8 minutes. Alternatively, place the dough into a stand mixer with a dough hook attachment and knead on low for 5-8 minutes, or until smooth and elastic. Form into a ball and place into a lightly greased bowl. Cover and allow the dough to rise in a warm environment until doubled in volume, about 1 hour. On a lightly floured surface, roll out the dough into a 12 x 15-inch rectangle. For the filling, mix together the sugar and orange zest until fragrant. Mix in the cornstarch. Gently stir in the frozen raspberries. Working quickly to prevent the raspberries from thawing, sprinkle raspberry mixture uniformly on the dough, leaving a 1-inch border around the edges. Starting lengthwise, roll the dough into a log shape. Trim off the ends and slice the roll into 12 evenly sized pieces. Place rolls into a parchment-lined 9 x 13-inch pan. Cover and let rise until doubled, about 30-45 minutes. Bake rolls for 20-25 minutes, or until lightly browned (internal temperature of 190 degrees F/87 degrees C). While the rolls are baking, stir together the melted white chocolate, heavy cream, and vanilla extract in a small bowl until smooth. Spread baked rolls with glaze using an off-set spatula while still hot. Serve warm.